The Moscow Kremlin (Russian: Московский Кремль), also known as The Kremlin, is a historic fortified complex at the very heart of Moscow, overlooking the Moskva River (to the south), St. Basil's Cathedral (often mistaken by westerners as the Kremlin) and Red Square (to the east), and the Alexander Garden (to the west). It is the best known of kremlins (Russian citadels) and includes four palaces, four cathedrals, and the enclosing Kremlin Wall with Kremlin towers. The complex serves as the official residence of the President of Russia. The Moscow Kremlin has remained a paradox since it was initially constructed in the early fourteenth century. Although its most prominent structures over the centuries have been its magnificent cathedrals and churches, it has at the same time been the center of political intrigue and global military aspirations. The Kremlin was home base to power plays involving the early Tatars and later on, the imperial tsars, who set the stage for even more vicious political infighting to come. All the while, Russian leaders were making their architectural mark on the Kremlin: Catherine the Great destroyed several churches to create her glorious neo-classical residence and Nicholas I had the famed Winter Palace removed entirely. After the Bolshevik Revolution, Lenin moved his living quarters into no less than the Kremlin Senate Room, while Stalin later had the towers at his new headquarters covered with shiny Kremlin stars. During the Cold War, the Soviet Empire ruled with an iron hand from the Kremlin and the building's name became practically synonymous with Soviet totalitarian power. Since the collapse of the Communist bloc, the Kremlin has continued to be the center of political power in Russia. 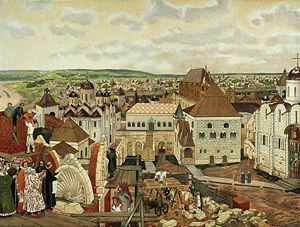 The Kremlin as it might have looked in the Middle Ages, by nineteenth-century painter Apollinary Vasnetsov. Church of the Dormition, constructed c. 1475. The site has been continuously inhabited since the second millennium B.C.E., and originates from a Vyatich fortified structure on Borovitsky Hill where the Neglinnaya River flowed into the Moskva River. The Slavs occupied the southwestern portion of the hill as early as the eleventh century, as testifies a metropolitan seal from the 1090s, which was unearthed by Soviet archaeologists on the spot. Until the fourteenth century, the site was known as the grad (fortified settlement) of Moscow. The word "kremlin" was first recorded in 1331 and its etymology is disputed. The "grad" was greatly extended by Prince Yuri Dolgoruky in 1156, destroyed by the Mongols in 1237, and rebuilt in oak in 1339. The first recorded stone structures in the Kremlin were built at the behest of Ivan Kalita in the late 1320s and early 1330s, after Peter, Metropolitan of Rus had moved his seat from Kiev to Moscow. The new ecclesiastical capital needed permanent churches. These included the Dormition Cathedral (1327, with St. Peter's Chapel, 1329), the church-belltower of St. John Climacus (1329), the monastery church of the Saviour's Transfiguration (1330), and the Archangel Cathedral (1333)—all built of limestone and decorated with elaborate carvings, each crowned by a single dome. Of these churches, the reconstructed Saviour Cathedral alone survived into the twentieth century, only to be pulled down at the urging of Stalin in 1933. When Dmitri Donskoi prepared to challenge the Tatar authority, he replaced the oaken walls with a strong citadel of white stone (1366-1368), which withstood a siege by Khan Tokhtamysh. Dmitri's son Vasily I made peace with the Tatars and resumed construction of churches and cloisters. The newly-built Annunciation Cathedral was painted by Theophanes the Greek, Andrey Rublev, and Prokhor in 1405. The Chudov Monastery was founded by Dmitri's tutor, Metropolitan Alexis, while his widow, Eudoxia, established the Ascension Convent in 1397. By 1475, the principalities of medieval Russia were united under Grand Prince Ivan III, who assumed the title of the Grand Prince of All Rus, envisioning Moscow as the only legitimate successor to Rome and Constantinople. In order to illustrate his imperial ambitions, Ivan organized the reconstruction of the Kremlin, inviting a number of skilled architects from Renaissance Italy, such as Pietro Antonio Solari and Marco Ruffo. 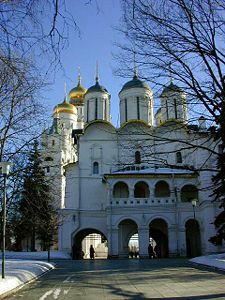 It was during his reign that three extant cathedrals of the Kremlin (see Existing Buildings, below), in addition to the Deposition Church and the Palace of Facets, were constructed. The highest building of the city and Muscovite Russia was the Ivan the Great Bell Tower, built in 1505-08 and augmented to its present height in 1600. 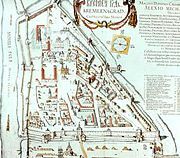 "Kremlenagrad": the first detailed map of the Kremlin (ca. 1601). After construction of the new Kremlin walls and churches was over in 1516, the monarch decreed that no structures should be built in the immediate vicinity of the citadel. Furthermore, the Kremlin was separated from the walled merchant town (Kitai-gorod) by a 98.5-foot-wide moat, over which St. Basil's Cathedral was constructed during the reign of Ivan the Terrible. The same tsar also renovated some of his grandfather's palaces, added a new palace and cathedral for his sons, and endowed the Trinity metochion inside the Kremlin. The metochion was administrated by the Trinity Monastery and boasted the graceful tower church of St. Sergius, which was described by foreigners as one of the finest in the country. During the Time of Troubles, the Kremlin was held by the Polish-Lithuanian forces for two years—between September 21, 1610 and October 26, 1612. The Kremlin's liberation by the volunteer army of Kuzma Minin and Dmitry Pozharsky paved the way for the election of Mikhail Romanov as the new tsar. During his reign and that of his son Alexis, the eleven-domed Upper Saviour Cathedral, Armorial Gate, Terem Palace, Amusement Palace and the palace of Patriarch Nikon were built. Following the death of Alexis, the Kremlin witnessed the Moscow Uprising of 1682, from which Tsar Peter barely escaped alive. This emotional trauma resulted in his dislike of the Kremlin. Three decades later, Peter abandoned the residence of his forefathers for his new capital, Saint Petersburg. View of the Terem Palace, by Giacomo Quarenghi, 1797. View from the Winter Palace across the Moskva River in the 1820s. Although still used for coronation ceremonies, the Kremlin was abandoned and neglected until 1773, when Catherine the Great engaged Vasily Bazhenov to build her residence there. Bazhenov produced a bombastic Neoclassical design on a heroic scale, which involved the demolition of several churches and palaces, as well as a portion of the Kremlin wall. After the preparations were over, construction was halted due to lack of funds. Several years later, Matvei Kazakov restored the dismantled sections of the wall, rebuilt the ancient Saviour Cathedral and some structures of the Chudov Monastery, and constructed the spacious and luxurious residence of the Senate. The residence was later adapted for use as the principal workplace of the President of Russia. During Napoleon's invasion of Russia in 1812, the French forces occupied the Kremlin from September 2 to October 11. When Napoleon fled Moscow, he ordered the whole Kremlin be blown up. The Kremlin Arsenal, several portions of the Kremlin Wall, and several wall towers were destroyed by explosions and fires damaged the Faceted Chamber and churches. Explosions continued for three days, from October 21 to 23. Fortunately, rain damaged the fuses, and the damage was less severe than intended. Restoration works occurred from 1816 to 1819, supervised by Osip Bove. During the remainder of Alexander I's reign, several ancient structures were overhauled in a fanciful neo-Gothic style, but many more were simply swept away as "disused" or "dilapidated" (including all the buildings of the Trinity metochion, which served as the ecclesiastical embassy of the Eastern Orthodox Church). 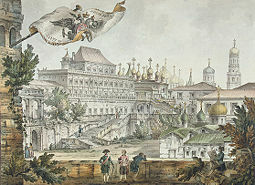 On visiting Moscow during his coronation, Nicholas I of Russia was not satisfied with the Grand, or Winter, Palace, which had been erected to Rastrelli's design in the 1750s. The elaborate Baroque structure was demolished, as was the nearby Church of St. John the Precursor, built by Aloisio the New in 1508 in place of the very first church ever constructed in Moscow. 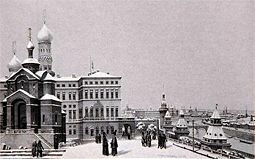 The architect Konstantin Thon was commissioned to replace them with the Grand Kremlin Palace, which was to rival the Winter Palace in St. Petersburg by its dimensions and the opulence of its interiors. The palace was constructed in 1839 to 1849, followed by the new building of the Kremlin Armory in 1851. Following this, there was virtually no new construction in the Kremlin until the Russian Revolution of 1917. The only new structures were the Monument to Alexander II and a stone cross marking the spot where Grand Duke Sergey Aleksandrovich of Russia was assassinated in 1905. These monuments were destroyed by the Bolsheviks in 1918. Panoramic view of the Kremlin during the Soviet Era. The Soviet government fled from Petrograd to Moscow on March 12, 1918. Lenin selected the Kremlin Senate as his residence—his room is still preserved as a museum. Stalin also had his personal rooms in the Kremlin. Eager to remove from his headquarters all the "relics of the tsarist regime," golden tsarist eagles on the towers were replaced by shining Soviet stars, while the wall near Lenin's Mausoleum was turned into the Kremlin Wall Necropolis. The Kremlin would remain the seat and symbol of Soviet power until the fall of the Soviet Union itself in the early 1990s. It remains the center of government in post-Soviet Russia today. Kremlin towers with St. Basil's Cathedral, nineteenth-century image. Existing Kremlin walls and towers were built by Italian masters over the years from 1485 to 1495. The irregular triangle of the Kremlin wall encloses an area of 68 acres. Its overall length is 2444 yards, but the height ranges from 16.4 to 62.3 feet, depending on the terrain. The wall's thickness is between 11.5 and 21.3 feet. 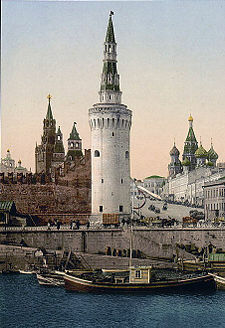 Originally there were 18 Kremlin towers, but their number increased to 20 in the seventeenth century. All the towers are square in plan, except the three with circular sections. The highest tower is the Spasskaya, which was built to its present height of 233 feet in 1625. Most towers were originally crowned with wooden tents; extant brick tents with strips of colored tiles go back to the 1680s. The Cathedral Square is the heart of the Kremlin. It is surrounded by six buildings, including three cathedrals. 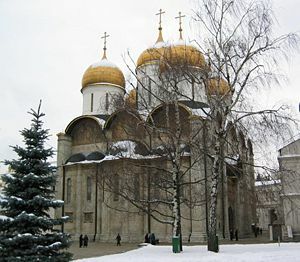 The Cathedral of the Dormition was completed in 1479 as the main church of Moscow and is where all the tsars were crowned. The massive limestone facade, capped with its five golden cupolas was the design of Aristotele Fioravanti. The gilded, three-domed Cathedral of the Annunciation was completed next in 1489, only to be reconstructed to a nine-domed design a century later. On the southeast of the square is the much larger Cathedral of the Archangel Michael (1508), the Muscovite monarchs from Ivan Kalita to Ivan V were interred. Church of the Twelve Apostles (1654-56). There are two domestic churches of the Metropolitans and Patriarchs of Moscow, the Cathedral of the Twelve Apostles (1653-56) and the one-domed exquisite Church of the Deposition of the Virgin's Robe, built by Pskov artisans over the years 1484-88 and featuring superb icons and frescoes from 1627 and 1644. The other notable structure is the Ivan the Great Bell Tower on the northeast corner of the square, which is said to mark the exact center of Moscow and resembles a burning candle. Completed in 1600, it is 266 feet thigh. Until the Russian Revolution, it was the tallest structure in the city, as construction of buildings taller than that was forbidden. Its 21 bells would sound the alarm if any enemy was approaching. The oldest secular structure still standing is Ivan III's Palace of Facets (1491), which holds the imperial thrones. Next oldest is the first home of the royal family, the Terem Palace. The original Terem Palace was also commissioned by Ivan III, but most of the existing palace was built in the seventeenth century. 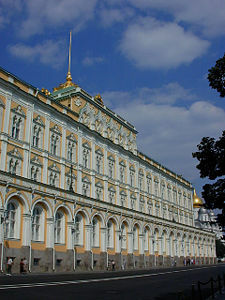 The Terem Palace and the Palace of Facets are linked by the Grand Kremlin Palace. This was commissioned by Nicholas I in 1838. The largest structure in the Kremlin, it cost more than one billion dollars to renovate in the 1990s. It contains dazzling reception halls, a ceremonial red staircase, private apartments of the tsars, and the lower story of the Resurrection of Lazarus church (1393), which is the oldest extant structure in the Kremlin and the whole of Moscow. The northeast corner of the Kremlin is occupied by the Arsenal, which was originally built for Peter the Great in 1701. The northwestern section of the Kremlin holds the Armory building. Built in 1851 to a Renaissance Revival design, it is currently a museum housing Russian state regalia and Diamond Fund. Ukrainian Association of Victims. The Black Deeds of the Kremlin. Basilian, 1953. All links retrieved April 24, 2018. Visitor's guide to the Kremlin's fortifications. www.moscow.info. Official website of the Kremlin Museums. www.kreml.ru. This page was last modified on 24 April 2018, at 14:53.